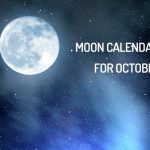 For this month of October, it is important to note that we will have two decreasing Moon phases. Here are the recommendations of the lunar calendar for October 2018. This is the best time to cleanse or purify your being and reflect on life in general. You must also pay attention to others during this waning Moon period which will start on 02/10 at 00:00. If you think you are getting away from the things that hurt you, then this is the perfect time. As this phase is the end of a cycle, it ends up becoming the perfect time to analyze the last events of the month and plan an alternative to the mistakes made. A health check in the week of 02 to 08 October will bring you only good news. And if you have a scheduled surgery in the same period, rest assured, your recovery will be fast. This phase of the lunar calendar for October is ideal for self-knowledge. Above all, avoid investing too much in a relationship that begins during this moon phase. This lunar phase, which will begin on 09/10 at 08:01, symbolizes personal renewal. It’s time to start new projects or a new foundation. Take advantage of the positive energy of the New Moon to start long-term projects, a wedding, a business plan, a higher education and even a savings project. This phase could, however, cause you to have trouble sleeping, sudden mood changes, increased irritability, stress or explosive emotions such as anger. It is recommended that you act with a lot of calm. During this phase of the lunar calendar for October 2018 which will begin at 3:25 pm, you must work a little harder to achieve the objectives that you set for yourself during the New Moon. This is not the time to relax if you are looking for a job or a soul mate. The Moon is in an increasing phase, so it’s time to take care of your hair, nourish it and allow it to regenerate itself. Your body easily assimilates and burns the calories you eat, so you can indulge – while remaining reasonable – because your body eliminates toxins without difficulty. The Full Moon of October 2018, which will begin on October 24th at 7:10 pm is particularly indicated for the requests made to the universe and the practice of magic power. Pay attention to what you say, because nothing will be kept secret or safe from many comments. It’s a great time to change jobs or residences. In this lunar phase, it is not advisable to work alone. Everything will be more complete if you join others. Do not start dieting for weight loss. At this point, this solution will not bring the expected result. If you are alone, it’s a good time to look for someone. The differences between the partners are very obvious in this lunar phase. If you have just started a relationship, you should listen to your partner to avoid potential conflicts that may arise during this time. Take this moment and improve your current projects and look for ways to invest in the future and succeed. You are aware that something makes you sick and you need to get away from it, but you do not know how? Well, the energy of this waning Moon is ideal to help you better analyze the situation and help you end bad habits. Use this week to focus on improving your appearance and increasing your self-esteem. If your love life is morose and makes you much more upset than happy, take this moment to end it. Suffering will not last long and you, just like your partner, will always be able to renew your energy for future relationships.